I was quite excited when offered the opportunity to read The Gown by Jennifer Robson. I had been seeing many positive reviews for it in various places. I thank TLC Book Tours for sending me a copy at no charge for my honest review. 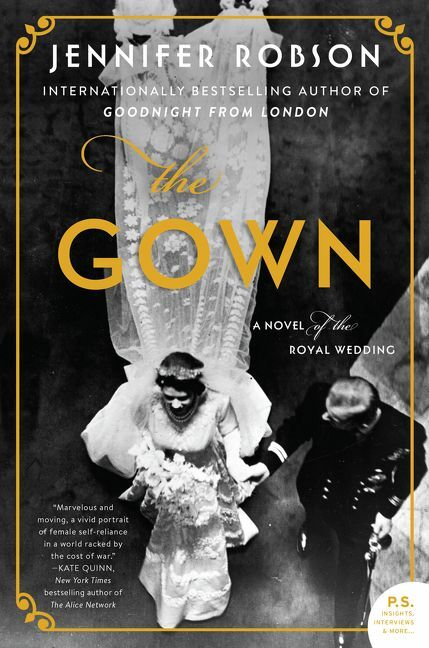 The Gown is ostensibly about Princess Elizabeth’s wedding gown – and yes, the book does spend some fair amount of time in the workroom of Norman Hartnell but this is really the story of two of the girls who worked on the dress. In the period after WWII England was still suffering from the aftereffects. Everything is rationed and it’s one of the coldest winters London has seen with little coal to be had for heat. The joy of a Royal Wedding is giving the country something to celebrate. Ann is a senior embroiderer working for Mr. Hartnell. She loves her work adorning the dresses for the royal ladies and other wealthy clients. Miriam is a young woman from France who is escaping the horrors of the war and the loss of her family to the Nazis. She uses her determination and skills to land a job at Hartnell’s and soon becomes friends with Ann. The two of them are soon living together and find themselves selected to work on the princess’s wedding dress. Soon after the royal wedding Ann leaves England for Canada and Miriam goes on to become a famous artist. Ann never speaks of her time at Hartnell’s with her family and none of them know of her history. It’s only when a box with her granddaughter Heather’s name on it is found after her death that the questions start being asked about Ann’s life before she came to Canada. Heather decides to go to England to find some answers. I cannot write enough about how much I enjoyed this book. Usually when I read a dual timeline story I prefer one time’s tale to the other’s but in The Gown’s case I loved both. The bulk of the story was spent in the past with Ann and Miriam as is to be expected but Heather’s part of the story is quite interesting as well. I was pulled into the story from the very beginning and I read the book in one day. It was hard to put it down and the only reason I did was to cook dinner. The portion that takes place in the present is perhaps one third of the book but it’s a vital part of the book and it pulls everything together. Given the premise, the heart of the story lies in the portion and Ms. Robson brought post WWII London alive in all of it’s gritty glory. She also develops her characters slowly and deftly so that as a reader you become invested in their lives. Her descriptions of the Hartnell workshop were fascinating. I felt like I was there with the young women as they went to work every morning and lived their excitement when they learned they would be making a wedding dress for the Princess Elizabeth. In a world that is grey, crumbling and bitter cold the joy of a wedding is contagious. The book is more than just the making of this iconic wedding dress, it is also the story of Ann and Miriam; of their friendship and of the relationships that move them into the future. Their friendship is a strong one and the women’s separate tales also make for fascinating reading. Miriam has been through so much as a Jewish woman in France; her family has disappeared and she has survivor’s guilt. Ann has lost family in the war and life is just hard for everyone in its aftermath. Ms. Robson brings post war London alive in vivid detail so that I felt the bitter cold and could taste the weak tea. The stories were captivating in both eras. It’s a book than any history buff or fan of Queen Elizabeth II will love.